Professor Lambert was at his wits' end, and with as much wit as he had that was a place he rarely found himself. All day he had been interviewing applicants for a job sorting books in the Seekers' library. No one who had come in so far seemed right for it. The last applicant had actually walked in eating Cheesy Neos, and Lambert had had to frantically prevent him from touching anything with his messy fingers. Having shooed the fellow out, the Gnorbu sat at his desk and wearily buried his head in his hands. "Er, may I come in?" asked a female voice. "Yes," Lambert replied. He couldn't help but wonder why she didn't simply knock like everyone else. "Oh, hello. I'm Cordeilla Earnshaw." The professor looked up, startled by the sudden nearness of the voice; he hadn't heard the door open. Standing before him was a young Ixi woman... and she was a ghost. He wasn't scared, just shocked. He was intelligent enough to realize that ghosts were generally harmless... it was the zombies you had to worry about. "I hope you don't mind that I didn't knock," the Ixi continued. "I tried to, you see, but I had a little trouble. Me hand went right through the door!" She let out a loud guffaw. Lambert gave a nervous chuckle and a small, uncomfortable smile. "Er... what can I do for you, Miss Earnshaw?" "I'm here to apply for the book sorting job you advertised in The Neopian Times." "And in what ways do you feel you are qualified for the position?" "Not much to be qualified for, is there? I know how to put things in order. I can read and write and all that. I learned that when I was in school in Neovia. I'm originally from there, y'see. I was in theatre but me career got cut short. I've always been a bit bookish, though, wantin' to learn. Oh, and there is one other thing I feel I must mention." Professor Lambert raised his eyebrows expectantly. "I'm a ghost," she confessed. "Yes, I guessed that," replied the Gnorbu scholar with a hint of sarcasm. "But don't let that bother you," Cordeilla continued quickly. "I don't go around scaring people—at least not intentionally. I'm just like a regular Neopet, other than being incorporeal and such." "Haven't I seen you before?" asked Lambert. A look of suspicion crossed his face as he remembered. 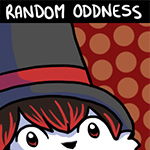 "Why, yes I have... at the obelisk battleground. You're a member of the Awakened." "Yes I am," Cordeilla admitted. "Well, rather, was. You see, I've left all that behind me. The only reason I ever joined up anyway was because at the time I thought it was the only option I had." Lambert looked at her in confusion. "I wouldn't think being a member of the Awakened is something you can simply walk away from. True, the repercussions can't be as severe as when trying to leave the Sway, but I imagine you have... obligations. What do those ghastly little twins think about your departure?" The ghost Ixi shrugged. "I don't know." "What do you mean you don't know? They're not the most expressive Neopets, to be sure, but they have to have some sort of an opinion about it." "I suppose they do," Cordeilla replied. "But I wouldn't know because I didn't tell them I left." "You slipped away without Lanie and Lillie knowing?" Professor Lambert looked positively aghast. He stole an uneasy glance at the door, as though expecting an undead army to burst in at any moment. "What happens when they realize you're missing?" "Oh, I don't think it'll be a problem," the ghost assured him. "When I was there they barely knew I was..." She stopped herself as she realized what she was about to say and laughed. "Well, they barely knew I wasn't alive. Sure, it was fascinating to them at first, having an entertainer at their little get togethers, but soon enough they moved on to other things. It did hurt, but after a while I was all right with it because I needed a change. I decided that I didn't want to be their trained Screal anymore. It was getting monotonous too, having to do the same old battles every other week or so for the same old dull boons." "Yes, well," Professor Lambert coughed. "I'm afraid we're in the same boat as far as that is concerned." "At least here I'd have a bunch of books to read to pass the time," replied Cordeilla. At that, Lambert couldn't help but give a small grin. 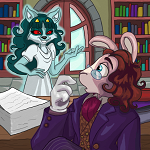 A desire for knowledge in any Neopet, alive or dead, was something that he liked to see. "Lanie and Lillie told everyone this whole thing was going to be a party, and that there'd be cake in that obelisk," the Ixi continued. "Turns out there was no cake, just some lady made of light who wants to control everyone and make them fight forever. I don't trust that Oracle thing one little bit, meself." "We have our suspicions as well." "I must say, too, that I never felt respected as part of the Awakened. 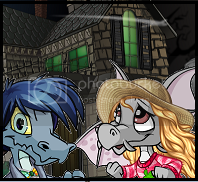 You know, most Neopets have a lot of misconceptions about the undead. They think we're all a bunch of uncouth slobbering monsters, but that isn't true. We're just like you—only dead." Lambert nodded. "I'm sure you are. Well, you're probably wondering why I'm looking for someone from outside of our society to do this particular job. My niece does help with the document sorting when she visits... though for her it's merely an excuse to make her stays in Brightvale even longer. She likes peruse the vast selection of books we have in our library, you see. As a result, her attention span is short in regards to the work and so it isn't done as well as it could be." He couldn't help but beam with pride at the thought of his young relative, a fellow bibliophile. "While we Seekers do love our books, we much prefer reading them to categorizing them." The Gnorbu cleared his throat. "However, as much as I'd like to hire you, If it's all the same to you, I'd rather not have an undead army unleashed upon us. I like my brain right where it is, thank you very much." "You needn't be concerned. If the Awakened ever do come after me, I'll take full responsibility for me actions. I won't allow them to harm any of you. I promise." "Think about it—I don't eat anything, I'm very quiet, and you won't even notice I'm here most of the time. Also, you won't need to pay me anything." That was a big plus! It was also true that she was the best Neopet he had interviewed today. "All right, then, Miss Earnshaw," replied the Gnorbu, a bit reluctantly. "I suppose you have the job." Cordeilla clapped her hands together delightedly. "Goodie! I'll move me things in tomorrow." "Move in? I didn't think—" Lambert stopped to think about it for a moment. "Well, I suppose you could move into one of the empty dorms." "Oh, that would be great!" said Cordeilla. "I hope I don't end up regretting this," Lambert mumbled to himself with a roll of his eyes. The next morning, Sandro made his way to the Seekers' library. He had spent the night reading through one of the newest volumes available there. Now he was on his way to return it. As was typical, though, he quickly became distracted by the countless other books that lined the shelves. Upon placing the one he was carrying on a nearby table, the Gelert picked another up and began to read it. Then, out of the corner of his eye, he thought he saw something very peculiar. The book on the table seemed to levitate and fly back to the shelf it had come from. "I've been awake too long. I must be seeing things," he murmured. "That book couldn't have moved on its own." All at once there came a giggle. "Of course it didn't. I moved it." Sandro yelped and fell backwards into one of the shelves. Books tumbled out and over him. Cordeilla instantly materialized, a look of concern on her face. "Oh my goodness! Are you all right?" she asked. "Sorry I scared you." Sandro stared with his mouth agape, completely at a loss for words. He was startled to see the ghost Ixi in front of him and yet at the same time found himself to be quite taken with her. "I'm all right," he finally managed to utter breathlessly. "But... you... who...?" "Oh, didn't Professor Lambert tell you? I'm Cordeilla Earnshaw, the new book sorter... uh, I guess that's what you'd call me. Or maybe I'm just a plain old librarian." Sandro picked himself up off the ground and quickly regained his composure. He dusted his waistcoat and straightened his scarf. "Oh, yes, yes, of course. I beg your pardon, Miss Earnshaw. It's just that I didn't expect..."
"I know, I know," she said, guessing what he was about to say. "You didn't expect a ghost. But don't worry. Oh, and I'm not a zombie so I don't do any of that brain eating stuff. I never have understood that, anyway, meself." "Er, I'm glad to hear that," came Sandro's awkward reply. Then he added, "Oh, believe me, I trust Professor Lambert's judgement." The Gelert cleared his throat. "Yes, well. I'm Alessandro Bloom, Philosopher of War, but you can call me Sandro. Everyone around here does." He gave a small grin. "The professor said you were from Neovia. Fascinating place, that. I'd visit if I weren't so deathly afraid of the Haunted Woods..." He stopped himself, realizing how that sounded. "Oh, I beg your pardon." "It's all right. I understand," Cordeilla chuckled. "When you live there, all the spooky stuff doesn't seem so strange... but I can see why it would frighten those who aren't used to it. Yes, I was a singer at the Neovian Opera House. It's kind of a long story but suffice to say I'm not there anymore." Sandro covered his mouth in a failed attempt to stifle a laugh. Cordeilla raised an eyebrow. "What's so funny?" "It's always been a bit of a silly dream of mine to become a musician. I do love poetry, and that's really what songs are, aren't they? Poetry set to music? Quite possibly my favorite poem is one called Kubla Koi. Perhaps you've heard of it as it's by a Neovian author. It's about an ancient emperor of Shenkuu building a Battledome arena there. A lot of the imagery in the poem is quite fantastical, but there is some truth to it all. There really was a Shenkuuvian emperor named Kubla Koi. The arena has never been found, so many believe that part to be just a myth, but I'm not so sure. Martial arts have always been a part of Shenkuu's culture, so there had to have been an arena there at some point. Oh, dear. There I go, rambling again." The Gelert tutted at himself crossly. "I'm probably boring you." "Not really," replied Cordeilla. "I'm just glad to have someone talk to me as a Neopet, not an undead monster." Sandro gave an understanding nod. "Well, anyway, Katie—that's Professor Lambert's niece—has actually suggested that we start a band. She's toyed with the idea of working on the programming of her robot, Tiny, so that he can provide some rhythmic beeping. We've considered a few band names... The Singing Scholars, Sandro and the Smug Philosophers—I came up with that last one. I would naturally be the lead singer as I have a rather fine tenor voice if I do say so myself." Cordeilla grinned—this fellow certainly was smug! "If you would like to start a band, there's no time like the present. You don't want to put things off until it's too late. Well, it's never too late, I suppose... but you have a lot less opportunities, believe me." There was a pause as Sandro coughed uncomfortably, unsure of how to respond. Finally he said, "Well, perhaps you'd like to help us then, Miss Earnshaw." The ghost Ixi's eyes lit up eagerly. "I'd love to," she replied. It was a night of a full moon. All the zombies, ghosts, and other undead creatures were gathered together in the usual place the Awakened held their parties. Lanie and Lillie paced around. Beneath their unreadable expressions they were troubled. Their guests all seemed very bored. They needed something to liven the party... in as much as it could be livened. Suddenly the two of them had the same idea. "We will get Cordeilla to sing for us!" "Cordeilla, where are you?" they called in their monotone voices. "Cordeilla!" Soon it became clear to the twins that the ghost Ixi was nowhere to be found. Ever so slowly, their eyes narrowed. "It's not nice to ignore an invitation to a party... especially when you are required to attend."